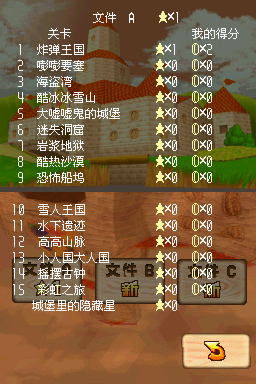 How to unlock 12 Power Stars (15 in DS remake) and defeating the Big Boo in the castle's courtyard. Big Boo's Haunt, also known as Big Boo's Mansion, is a three-story mansion owned by the Big Boo located in a small cage. It is the fifth course in Super Mario 64 and Super Mario 64 DS. Instead of accessing the course via a painting, the player must travel to the castle's courtyard after they have collected 12 Power Stars (15 in the DS remake) and defeat the Big Boo containing a small cage. When near the cage, the player's character will shrink down and enter it. It is the only course in the game that does not share a theme with another course, and has the most boss fights, with Big Boo being fought three times and Big Mr. I being fought once. In the DS version, this is the only main course Yoshi cannot access entirely, since he cannot defeat or eat Boos. It is also the only course to have a level inside it required to free a playable character. Map of the area outside of the mansion in Super Mario 64 DS. Big Boo's Haunt takes place within the cage. There are two buildings in the course: the main mansion and a shed off to the side. Around the mansion are several Scuttle Bugs and an entrance to a secret room with a couple of Boos is at the back of the mansion. The mansion consists of three floors, though only the first floor is accessible during the first mission (unless the player has unlocked Luigi in the DS version, in which case the player can easily jump to the next floor). The rooms of the first floor consists of, from left to right, a room with the Mad Piano, a library, a dungeon, a room with a falling bridge, and a room with a large hole and some platforms. If the player falls into one of the holes, it will lead them to the Merry-Go-Round area underneath. Once all the Boos and the Big Boo on the first floor are defeated, a staircase to the second floor will appear. The second floor has the same amount of rooms as the first, as well as the course's Star Marker. The second door from the left leads to a large library with books flying out of the shelves, trying to attack the player. The end of the library leads to the first room from the left, which contains a Power Star. The third room has a wire-frame grate floor above the dungeon room, the fourth room has several coffins that will rise when the player approaches them, and the fifth room contains a bookcase with Bookends and a large, turning platform that will drop the player into the Merry-Go-Round area if they stand on it for too long. The door in the back of the fifth room leads to a blue ! Block (or a red ? Block in the DS version) and a door above on a ledge leads to the third floor. The third floor consists of a small hall with doors to the balcony and a secret room containing the Big Mr. I. In the DS version, a Luigi painting that brings Mario to the Big Boo Battle stage is also present in the hall. To access the room with the Big Mr. I, the player has to be Vanish Mario or Vanish Luigi and enter through the large picture of a Boo before the power wears off. On the balcony lies the Big Boo and the player can Long Jump from the platform to access the roof. The shed on the grounds of the mansion leads to an elevator that will bring the player to large halls when stepped on. At the end of the halls is a room with water and a Merry-Go-Round in the center, accessed by doors on either side. The Merry-Go-Round has a large spinning platform in the center and several portraits of Boos. One of the portraits has actual Boos come out of it and another acts like a flamethrower. Super Mario 64 DS This mission's objective is to defeat all the Boos followed by the Big Boo on the first floor. Super Mario 64 DS The mission's objective is to defeat the Boos on the Merry-Go-Round. Super Mario 64 DS This mission's goal is to collect the Power Star behind the library on the second floor. Super Mario 64 DS This mission involves collecting the eight Red Coins scattered throughout the mansion. Super Mario 64 DS This mission's objective is to defeat the Big Boo on the balcony. Super Mario 64 DS This mission involves defeating the Big Mr. I in the third floor's secret room. Super Mario 64 DS This mission's objective is to collect the Switch Star near the Merry-Go-Round. Static Mushroom : #1 On the top of the shed. Box Mushroom : #2 On the top of the mansion. Mario Golf: Toadstool Tour: The mansion makes an appearance on Hole 2 of the Bowser Badlands in Mario Golf: Toadstool Tour. New Super Mario Bros.: In New Super Mario Bros., the minigame Hide and Boo Seek is set in the main lobby of the mansion. The music for the Merry-Go-Round from this course is also used in the minigames Lakitu Launch, Bingo Ball and Slots Shot. Mario Strikers Charged: A remix of the Merry-Go-Round's theme is in Mario Strikers Charged as Boo's theme whenever he scores a goal. Mario Kart 8: The Merry-Go-Round music is also used near the Aqua Cups area in Mario Kart 8's Water Park. 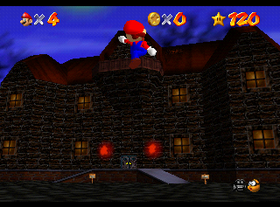 If the player activates first-person view when Mario is close enough to enter the course, the player can still move the camera for a bit before the screen transitions to the star select screen. Big Boo's Haunt is the only course to not share music with another course in the game. In the DS version, a green cap appears on the Boo in the back room of the first floor. Using hacks to enter the course as Yoshi, it can be shown that Yoshi is able to tongue the cap off the Boo and turn into Luigi as if the cap were on a normal Goomba. This page was last edited on April 7, 2019, at 06:58.